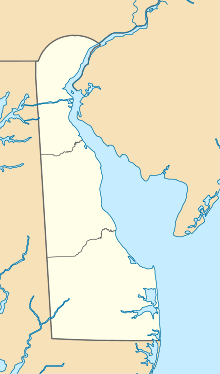 Chandelle Estates Airport (FAA LID: 0N4) is a public use airport located three nautical miles (6 km) northeast of the central business district of Dover, in Kent County, Delaware, United States. It is privately owned by RJR Airdrome, Inc.
Chandelle Estates Airport covers an area of 27 acres (11 ha) at an elevation of 22 feet (7 m) above mean sea level. It has one asphalt paved runway designated 4/22 which measures 2,533 by 28 feet (772 x 9 m). For the 12-month period ending August 23, 2007, the airport had 6,800 general aviation aircraft operations, an average of 18 per day. ^ a b FAA Airport Master Record for 0N4 (Form 5010 PDF), effective 2009-05-07.